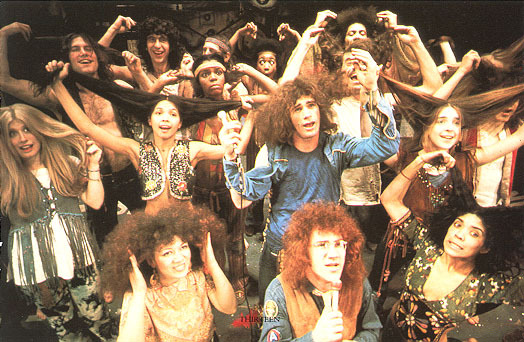 Broadway cast performes the song circa 1970. Front row, left to right: Angie Ortega, Allan Nicholls (Claude), Denise Delapena. Next row, left to right: Victoria Medlin (Sheila), Lillian Wong (Crissy), Oatis Stephens (Berger), Debbie Offner. Behind them, left to right: Robin Eaton, John Aman, Lorri Davis, Rick Granat, Ada Clay (? ), Michael Gormley, Larry Marshall, Fluffer Hirsch (red vest).